The Harmonics 208 promises to deliver up to 14-hour.s of talk and music playback with 430 hours of standby on a single charge. The company says that the headphones have a balanced design which allows you to not only keep the headphone secure in your ears even on a run but you can also store it and take it anywhere you go. Portronics has launched its 'Harmonics 208' stereo wireless headphones. The company says that the headphones have a balanced design which allows you to not only keep the headphone secure in your ears even on a run but you can also store it and take it anywhere you go. The Harmonics 208 promises to deliver up to 14-hours of talk and music playback with 430 hours of standby on a single charge. It is backed by a 200mAh in-built rechargeable battery with an estimated charging time of two hours. 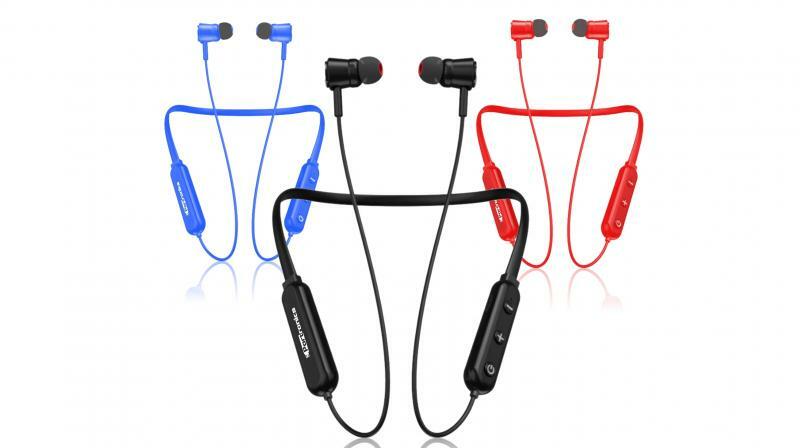 The headset can also be used for both making and receiving phone calls from any Bluetooth enabled smartphone. The company says that this wireless headphone has a strong magnetic speaker with Acoustic Echo Reduction technology which helps reduce the background noise during phone calls. It uses power-efficient Bluetooth 4.1 BLE low energy which does not drain the battery quickly. The headset provides a range of up to a 10m and can be connected with two devices simultaneously. The Portronics Harmonics 208 comes in Black, Blue and Red colour variants and will be available for purchase both online and offline stores at a price of Rs 2,999.